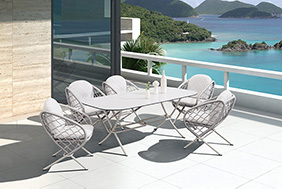 Our high-profile collection offers you eye-catching furniture for patio’s, terraces, gardens or pools. Suitable for creating a luxurious style at home or restaurant. Get inspired by our brand new collections of 2019/2020. 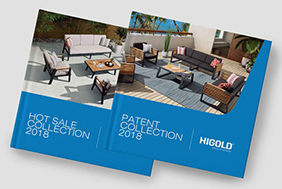 Some stunning new catalogues with all the new designs of Higold Outdoor Furniture. 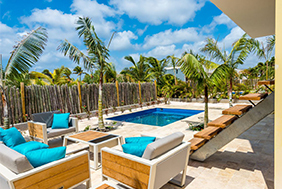 Modern and stylish that’s what the luxury 4 bedroom villa styled with our Higold collection are. Live the excellent life at Delfts Beach resort with Higold! Are you inspired? Do you want to see and experience the collection yourself? 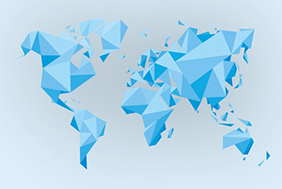 Please contact our European headquarters for the nearest dealer-store in your country. Being conceived for the outdoor, the Pininfarina design team took the inspiration from the dynamism, elegance and purity of the ocean waves, the empty space that is created when a wave is broken, resulting in to a hollow or tube wave (onda in Italian). being an aesthetic element becomes also a functional element, a rigid armrest that can be used to lean objects. The choice of the materials come from the Pininfarina 360° design experience: the aluminum – coming from the carsector – for the structure, the fabrics – used in the yachts for its resistance – for the cushions. The Collection is composed by a modular sofa, a two seats sofa, an armchair and a coffee table. “We have looked at the magic of nature to give life to Onda which is distinctive and, at the same time, able to be integrated in different environments. Technology and know-how coming from different sectors make it really unique” affirms Paolo Pininfarina, Pininfarina Chairman. “Pininfarina always brings breakthrough visions and futuristic designs to the world. 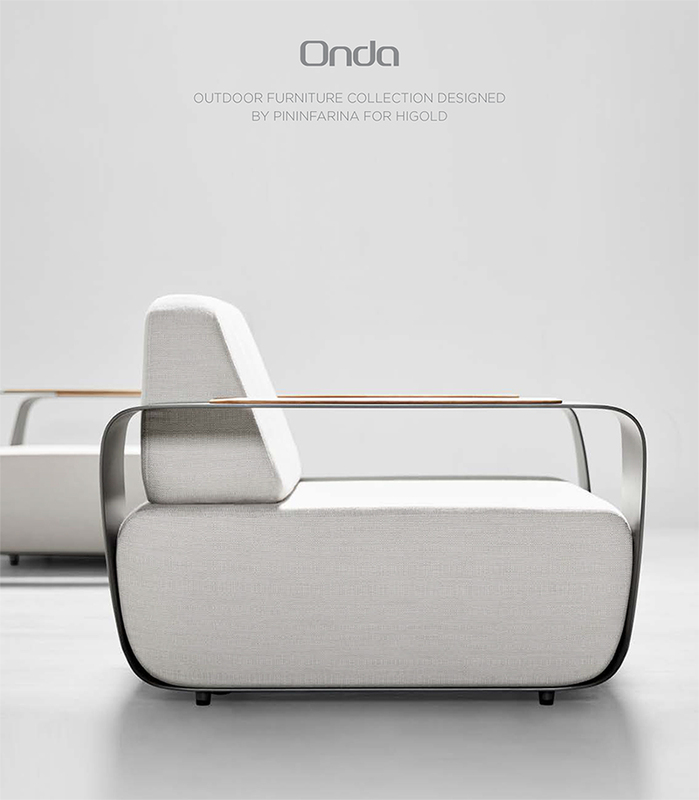 The design of Onda is influenced by car design in the technology and in the use of top materials. We are sure the new revolution is ready in the outdoor furniture industry!” affirms Alwin Ou, Chairman of Higold Group. 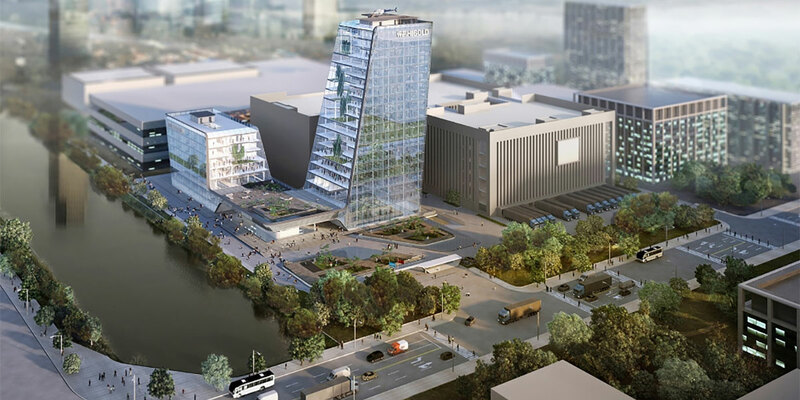 The new Higold Headquarter, which will rise in Shunde, is an iconic, elegant complex where architectural elements, public spaces and products are integrated in a unique, strong identity. Pininfarina Architecture has authored the whole architectural project, from the façade design to the landscape.